It’s officially November and there is so much stuff to look forward to, like wearing your cute new wool coat, indulging in your grandma’s famous pumpkin pie, and waking up at the crack of dawn to go shopping on Black Friday (well, maybe more like dreading that last one). There are also a slew of new beauty goodies that hit stores come November, making the month that much sweeter. Click here to see the best new beauty products in November 2012. Since Halloween has come and gone, and you’re probably filled up on chocolate and candy corn by now, indulge in something that’s calorie-free, like beauty products. (Plus, it’ll help you save room for the delicious smorgasbord that is Thanksgiving!) 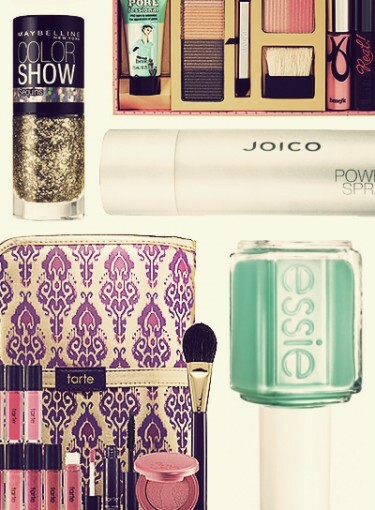 Go for these new goodies, like gorgeous jewel-tone glitter nail polish from Maybelline or Benefit’s adorable jetsetter makeup kit. We’ve even got some amazing high fashion collaborations on our November hit list. Also, a little November tip: don’t make the same mistake you did last year and start your holiday shopping at the last minute. All of our product picks would make amazing presents or stocking stuffers, so get a head start on your massive shopping list at the beginning of November. That way you won’t be one of those poor unfortunate souls braving the mall on December 24th. Ready to see the best of November? Turn on the TV to a station that’s playing “A Charlie Brown Thanksgiving” and get into the spirit with our beauty product and fashion roundup.